When Big Brother was younger, one of his favorite games was a Toy Story Themed Yahtzee Jr. Game . It is a fun dice game for young kids! Several years and a few missing pieces later, I was inspired to create our own yahtzee-inspired dice game. With some homemade dice, I created a Yahtzee Inspired Shapes Game that my 3 and 5 year old could play. 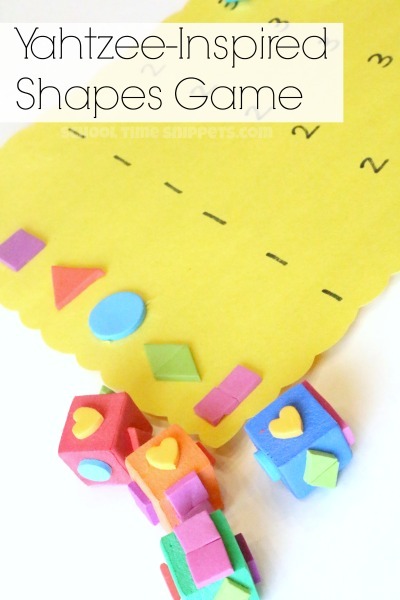 This fun shapes dice game is great for color and shape recognition skills and basic addition! First set up the game board by placing a foam shape sticker along the left side of the construction paper. Next, in each row write the numbers "1, 2, 3, and 4." Grab four foam blocks to make the game dice. Place a foam shape sticker on one side of each dice. So in the end, each foam die will have a heart, square, triangle, circle, diamond, and rectangle. I did have to be a bit creative making the diamond and rectangle shapes as our foam collection did not have those. Alternatively, you could use a marker to make the shapes, instead. But we have loved having this huge stash of foam shape stickers; I am sad that they are almost gone! To play, give your child six manipulatives of the same color. We chose star beads ; yellow, pink, and turquoise. Player 1 rolls all four foam dice. If the player has more than one of the same shape, the player may keep those and roll the other dice 2 more times to get more of the same shape. After three rolls, place your manipulative on the highest number of that shape you rolled. For example, if you rolled 2 circles after 3 tries, you find the row for circle and place your manipulative on the number 2. Continue playing until everyone has played their manipulatives on each shape. Then count your total. Player with the highest score wins! 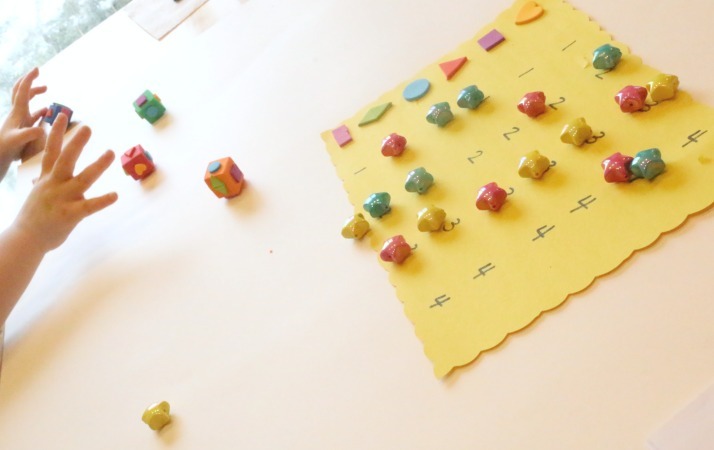 Dice whether homemade or store-bought make a great manipulative to learn with! 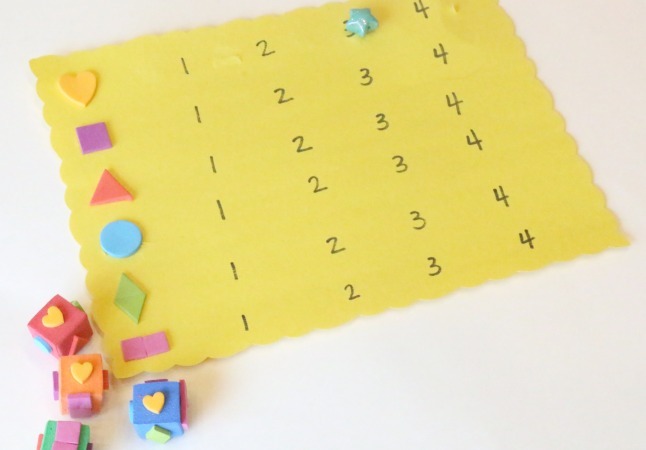 For more creative manipulative activities, check out our Math Made Fun with Manipulatives Series!